Will it make the boat faster? // We covered a lots of territory and as you can see from the topics its related to rowing, injuries, movement skills, strength training and the list goes on. Its always been great to be able to have conversations like this and to share and explore learnings from sport. Joe comes from a rowing background and has combine his love of rowing with being a strength coach. LEO Training is the resource for strength & conditioning and injury rehabilitation for the sport of rowing. Over the years I guess I have always had an interest in share we were doing in training and I felt it was important to help others find their way in the sport and figured that with the internet and things like blogging it was a great way to do this. 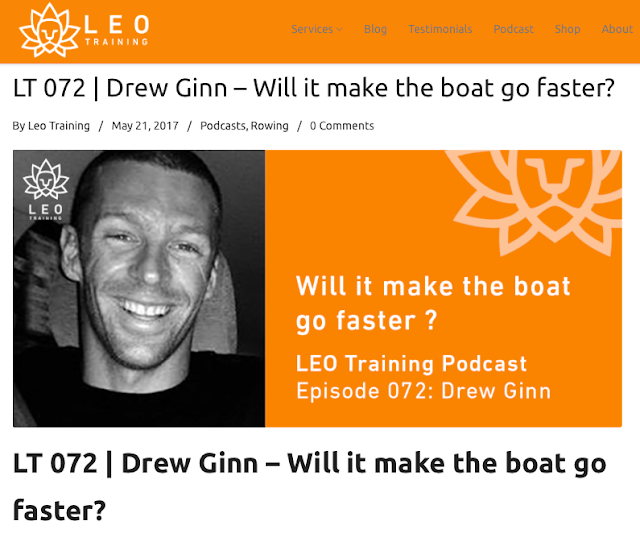 The conversation with Joe was a nice reminder of this and to find out a little more about his approach to strength training to help rowers row faster I was really happy to to be involved. Plus to hear about some of the great people he has interview was great as his direction feels aligned to much of what we took over the years. His site is definitely worth a look and its a solid resource to revisit.